Garth Crooks has heaped praise on Liverpool youngster Joe Gomez as the defender continues to enjoy an outstanding season at Anfield. Despite injury problems down the years and plenty of competition for a first-team place, Gomez has established himself as a crucial member of this Reds side this season. 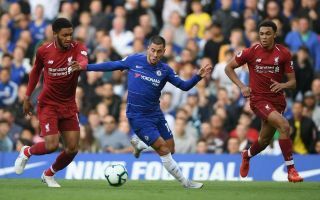 Now the clear first choice partner for Virgil van Dijk, the England international is also very capable at right-back, and Crooks has compared his defensive qualities to legendary Chelsea duo John Terry and Ashley Cole. The pair were rock solid for the Blues and for England for many years, and are widely thought of as being among the finest defenders in Premier League history. Gomez certainly has a long way to go to match their achievements, but at the moment he looks a special talent who has the world at his feet. The 21-year-old made Crooks’ BBC Sport team of the week, with the pundit positively gushing over him, saying: ‘Regular readers will know what I think of Joe Gomez so I won’t waste any more column inches on that. ‘Suffice to say this: How the England centre-back kept the ball out of Liverpool’s net with Allison beaten during Sunday’s game with Everton, I will never know.